My plans have arrived for my Stalker so I thought it time I introduced myself and kept a log of the process. Apart from Matt's awesome designs, these forums were a big factor in deciding to go with a JEM boat for a first time build. I deliberated over design for quite a while before settling on the Stalker. I live in Goulburn in Australia, not far from Canberra. I want a boat to fish the many lakes and rivers in the ACT region, most of which are only open to unpowered or electric craft. I also spend a reasonable amount of time on the south coast so would be fishing the many various rivers, lakes and estuaries down that way. So I'll do my best to keep updating with my progress. I'll be buying materials to get started this weekend and will be seeing how much I can get done with a week off work, although with a 2 year old the build time will more than likely be on the slower side. I can't wait to get stuck in and look forward to "borrowing" all the great ideas I have seen on these forums. Welcome aboard! Looking forward to hearing and seeing the build. I started the lofting process today. It's painstaking work, and very easy to make mistakes but I found it really enjoyable. Important to check everything at least a couple of times though. I didn't take any photos as lofted panels are not very exciting. I did however spend the weekend building this, and I am really glad I did as drawing up those panels on the floor would have been a nightmare. The plywood I am using is 4mm Pacific Maple (Meranti) marine ply. It has B grade face both sides but I'm prepared to paint the boat anyway. Being a first time build there may be things I have to cover up . The best thing about it is that it was $33 per sheet, compared to $80+ for hoop pine. That's a smart approach for your first time: Do the best you can but accept you'll make a couple minor mistake that a nice paint job can cover up. 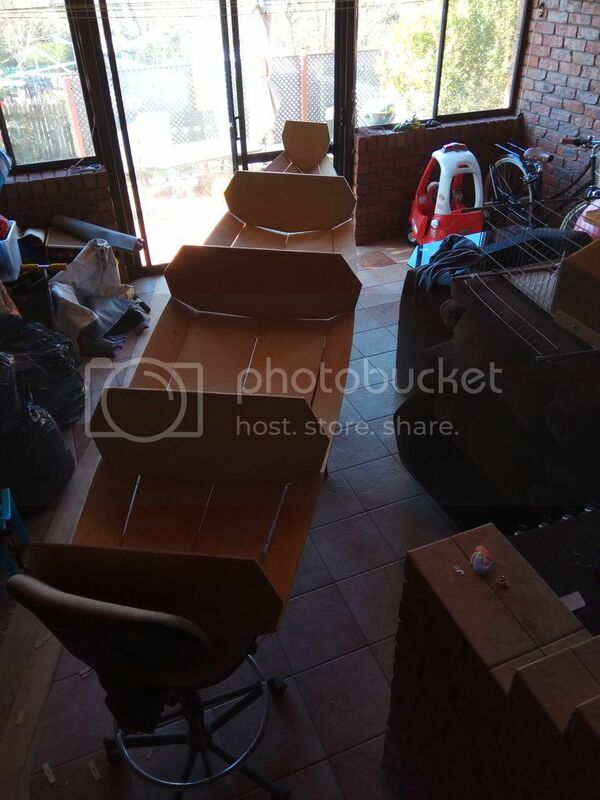 And wise move to make yourself a nice workbench. 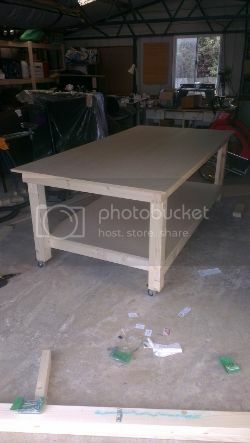 If your boat comes out a quarter as nice as that work table it will be a beauty. Well, finally some progress to report on. I've been snatching the odd bit of time here and there while the boy has his naps and have been getting panels cut out and sanded. It's been a bit of a waiting game though as I only have the weekends to do stuff that involves power tools (I'm away from 7am-7pm weekdays for work). Now that that's all done though I can utilise nights during the week. 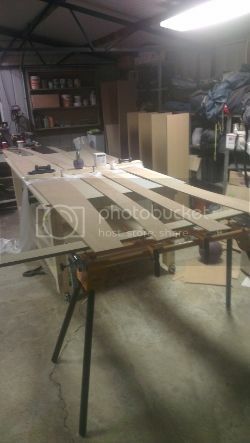 Tonight I got the panels all glued up and hopefully I'll get fibreglass splices on them over the next couple of nights. If all goes to plan I might be able to start stitching by Sunday. I'm really looking forward to it starting to look like a boat. I love mine, just don’t get to use it as much as I would like to. So looking back at when I started this, I had one child and life was very different. I now have three and the boat panels have been sitting in the garage waiting. They've even moved house as well. The weather over here in Oz is starting to warm up, fishing season is about to open, and I really want this boat for at least some of it! I've been using a plastic kayak for a few years but the extra space and versatility of this boat would be so much better. Not to mention that I would like to make a few overnight camping trips up various rivers in my region this summer. So stitching started this morning and this is where I'm at right now. I'm still snatching time between doing stuff for the kids but I'm determined to see this through!